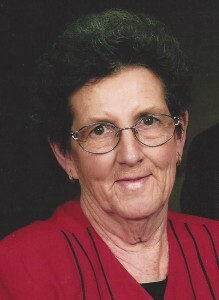 Mamaw was born in Vanceburg May 17, 1938, to Verna and Kermit Riley. She loved children and worked for years at the YMCA Child Care where she was given the name Mamaw by all the children she cared for. Not only did she love children but also loved her homemakers club and considered them as her family. She loved making crafts and quilting. You could give her a glue gun, flowers and some other odds and ends and within minutes she would come up with a masterpiece. Mamaw also loved to cook and wanted everyone to enjoy her food. From her homemade hot dog sauce to her scalloped potatoes, she always made everyone’s favorite at any and all gatherings. She so loved her family and raised her six children with a strong work ethic and to always give 110 percent to whatever they did. Mamaw loved her great grandkids and even cared for four of them on a regular basis when they were younger. It was funny how she would let them get by with so much more than she did her own children. Every time a child was around her you could see her spirits lift. As much as she loved all of the above, it was the love she had for God and her church family that got her through so many hard times with her illness. She always would say, “God is right here by me.” She was a loyal member of the Lewisburg Baptist Church where she put her love for God, children and her cooking into great use. She leaves behind her husband, Manford Beckett; daughters, Charlotte (Eddie) Lucas, Loretta (Jackie) Howell, Debbie (John) Mattingly, Barbie (Jack) Davis, and Patti (Kevin) Clark; and her son, Brian (Danielle) Beckett. She also leaves behind several grandchildren; great-grandchildren; sisters, Faye Elliott, Carol Fugate, Judy Howell, Thelma Doyle and Peggy Hester; brothers, Norman Riley, Ricky Riley and Jimmy Riley; and a special neighbor, Junice Foster. Welcoming her into her eternal life are her parents; four grandchildren, Chelsey Lucas, Cheyanne Lucas, Gabriel Downs and Elijah Downs; and sisters, Louella Thompson, Patty Riley and Betty Clegg. Services for Virgie Beckett were at Lewisburg Baptist Church Friday, February 12, 2016, with Rev. Jonathan Groves officiating. Burial was in Wedonia Cemetery. Knox and Brothers Funeral Home in Maysville served the family.